Description: This is a 9-piece floating playset designed to be used in the tub, pool, or floor. The building has a tan base with 2 boat docks for the accessory boats, and a white building with a blue roof and an attached lighthouse. There is a slide in the lighthouse, a working boat lift, a diving board, gas pump, and a working light beacon on top of the lighthouse that rotates. As with most playsets, the most non-descript piece is the hardest to find...the red rotating beacon and attached clear plastic dome that fits on top of the lighthouse. 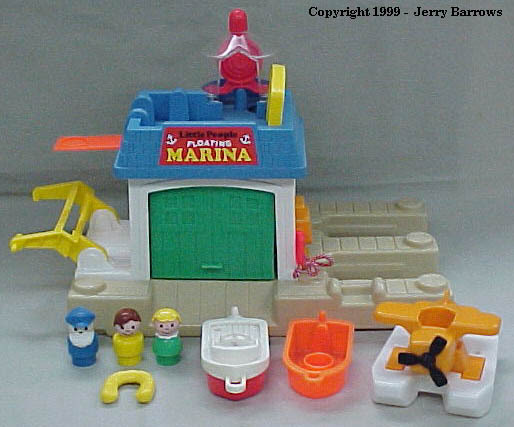 The set also includes 2 exclusive boats, and an exclusive sea plane (which was omitted in 1990). The boats store in the boat dock, and other accessory pieces store inside the marina. B2582B - Tan plastic floatable base with 2 molded boat docks on the side and an attached small squared white marina building with a blue roof. *See "Variations" below. FPT1020 - Clear plastic cylindrical cover with red revolving light "beacon" inside. Measures approximately 5" tall, 3" diameter. FPT917 - Boat Lift - Yellow curved plastic "H" shaped piece that has two cross bars supporting two long curved crane arms. Looks like a football goal post (if you use your imagination real well). One end attaches to the Marina base and the other end supports the speedboat via two male pegs. FPT825 - Orange 1-seat sea plane with white floats (landing gear) under the plane, and a small black propeller (3 rotor blades) on the front that spins. *This plane was omitted in 1990. FPT780 - Orange open single seat rowboat with no "deck". The front of the boat has an enclosed hole that fits within a peg on the marina base dock. The back of the boat has a peg sticking up, and a hole under the peg that allow the boat to be lifted by the FPT917 boat lift. *See "Variations" below. FPT565 - Red top, White base 1-seat boat with a raised molded steering wheel and a "deck" around the seat. The front of the boat has an enclosed hole that fits within a peg on the marina base dock. The back of the boat has a peg sticking up, that allow the boat to be lifted by the FPT917 boat lift. *See "Variations" below. AIPP - Short blue captain with a white beard and moustache, and a blue cap. FSPP - Green girl with a blonde sculpted bob. EZPP - Yellow boy with brown molded hair. B2582A - The marina base was also available with an orange base opposed to tan. The sea plane and 1-seat boat were discontinued in 1990. FPT278 - Yellow open single seat rowboat with no "deck". The front of the boat has an enclosed hole that fits within a peg on the marina base dock. The back of the boat has a peg sticking up, and a hole under the peg that allow the boat to be lifted by the FPT917 boat lift. FPT565 - Red top, White base 1-seat boat. FPT276 - Red top, Red base 1-seat boat. FPT902 - White top, Red base 1-seat boat. FP2582BOX1988 (Box ONLY) - Set was sold in a 13-1/2" high, 9-7/8" long, 8" deep box. FP2582SET1988 - Complete set with box. WFL: 07-BC-13-1-A.